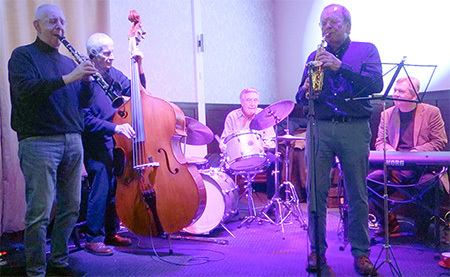 Thank you, Alvin, Mike, Roger, Martin P and Martin H for weathering the snow to make it to Tad Newton’s Walnut Tree Jazz Club in good time on Sunday, 21st January. And thank you Alvin for giving me the go ahead to film several numbers. The lighting wasn’t too good and the spot was poorly positioned due to set ups for other events. But with a little iMovie manipulation the YouTubes turned out pretty well and the sound is good.